Planning an event can be a daunting task, especially if you’ve never done it before. At ID&C, we’ve worked with organisers running every kind of event manageable and along the way we’ve picked up a wealth of knowledge on what to do and what not to do when embarking on an event plan. There are literally hundreds of things to consider when planning your event, and no two events are the same, but along with Luke Stretton, Events manager at Teeside SU, we’ve put together our Top 10 tips for student event planning. 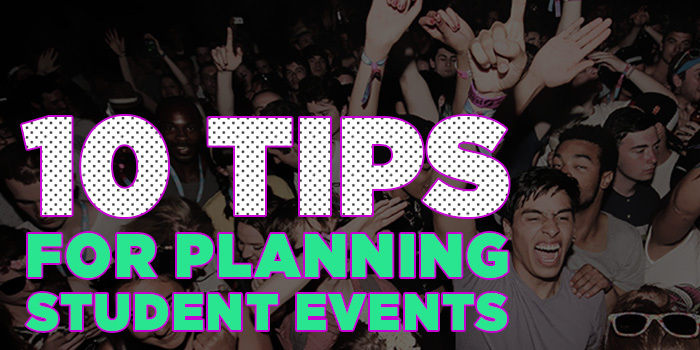 We've covered everything from choosing the right date and venue to selecting the most suitable event wristbands, so without further ado, delve into our top 10 tips and get planning! 1. Why are you holding the event? It’s always a good starting point to remind yourself why you’re running a particular event. This might sound a bit silly, but even if it’s blatantly obvious, like “it’s Freshers' Week, err!” just taking a moment to think about what Freshers' Week is all about will help your creativity for all aspects of the planning. Again, you might think this is an obvious one, but you won’t always be running a fresher’s event, so carry out research on your target audience. Consider questions like how many males Vs females are on campus and are more people into dubstep than indie? "Who is the event marketed at? Think about the different student demographics and what you’ll need to do to lure them away from any competition." Your choices might be limited, but you should always consider the type of venue for your event. Is it big enough to hold at capacity? Does it suit the event? You wouldn’t want to host a summer ball in a dingy underground basement, nor would you want to promote a heavy metal line-up at a 5-star hotel! The chances are, you’ll be battling against other nights and competition in the local area, so when you decide to hold your event is very important. Avoid clashing with nearby high-profile events, check if there’s a big football match on TV that night and depending on the type of event, it's a good idea to run things just after payday. 5. Does your event need a theme? It might seem a bit overdone, but a quirky theme can really add to the experience of a club night. A theme gets people talking, and becomes something no one wants to miss out on. Fancy dress has been popular with students for years and is an easy way of creating a buzz around your event. Having a big name DJ at your event can be a guaranteed crowd-puller but it doesn’t come cheap and if you work on building a strong following, you won't have to rely on famous acts to sell your tickets. Bright idea: Give free entry and a couple of drinks vouchers to a student photographer in return for posting loads of photos on your Facebook page. Not only will this give them valuable experience for their CV, it will also engage your audience and help build a following. "There’s an expectation to have big-name acts at a Students’ Union, but when you consider the associated costs of well-known artists and the popularity of established local venues, it becomes harder for SU’s to meet student expectations. We try to throw a sensational fresher’s fortnight to solidify the Students’ Union and then top up with 3 – 5 big acts a year, these might be DJ sets from bands or Radio 1 DJ’s." Social media has opened up a world of possibilities when it comes to promoting your events but just because Facebook and Twitter are free, it doesn’t mean advertising is easy. It may sound simple, but by posting your event details weeks before the date, people will click 'interested' and this will show up on their friends' pages, giving you free word-of-mouth. Interact with your audience the whole year round, get feedback, run competitions and get them to buy into your brand as much as possible. Just sending a Facebook event invite won’t cut it these days. "Posters and flyers are still effective but we often use one flyer design across a number of different events – it’s a money saver. We also use other channels like ads and banners on the TV screens around the University. Facebook and Twitter are, without doubt, our biggest promotion tools, even more so than our website." OK, this one is our speciality. Consider your budget but also think about the loss you could find yourself with if your security wristbands are easy to take off, duplicate or forge. Always customise your wristbands, it's the best way to avoid any dodgy fakes and is a chance to promote your brand. At ID&C, all of our event wristbands have tamper-evident closures, from super cheap Tyvek wristbands to luxury woven wristbands – whatever your budget, don’t forget the importance of security wristbands, each person without a genuine wristband is lost revenue. "The quality and style of the wristbands are associated to the ticket price. At our regular events, we go for Tyvek bands, for end-of-term events and balls, we tend to use vinyl wristbands and then for Freshers Week wristbands we opt for fabric. 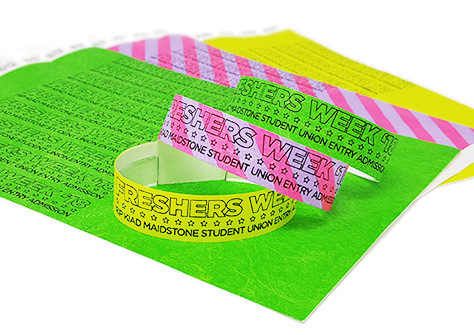 Our freshers’ have to wear them for up to two weeks and the festival-style wristbands are far more durable, as well as being a great memento of some messy nights out!" Remember, you’re running a business and in most cases will have targets to hit and funds to raise, so budgeting is essential in our top 10 list. "Use figures from past events to estimate attendance and revenues. Consider what the price point for tickets and drinks promotions needs to be, then offset this against your expenditure and estimated attendance. Sometimes you have to run loss leaders to maintain your following. We run a Friday club night that doesn’t always make a profit but it keeps the brand competitive." It's the least fun part of event planning, but leave it to chance and you could live to regret it. Remember, you’re working with crowds of people, so safety is paramount. Work closely with the venue and make sure all the necessary health and safety procedures are in place - and the paperwork is there to back it up! If you’re unsure about what’s required for health & safety at your events, this handy online event safety guide will help. After all, it's what Fresher's weeks all about isn't it? Tap into event ideas that bring people starting their journey at university together. Where like-minded individuals can strike up lifelong friendships. After all, it can be a little daunting for teenagers leaving home for the first time. Use your events to promote clubs, classes, and groups within your university for sign-up. If you're looking for music writers at the Student Union newspaper, advertise this at Fresher's gigs. And if you're looking for current students with outgoing personalities to promote your university during Fresher's Week Tours, give event tickets out to those who help. If your university has any sponsorship deals or brand links, you'll want to get them onboard during this time to sponsor specific events and parties or simply supply free giveaways. We hope our top 10 tips stand you in good stead. Whether you’re a newbie event organiser or a seasoned pro, keep our guide to hand and you’ll be off to a good start. For more hints and tips, get in touch with us, and remember when it comes to security wristbands and passes, you'll find everything you need here on our website. You can even design your own event wristbands online with our wristband designer. A massive thank you to Luke Stretton from Teeside SU for helping us put this guide together. Luke’s been running events for over a decade, so we thought we’d tap into his mind and extract some knowledge nuggets - we hope you found it useful!